For drop shipping entrepreneurs, the questions of shipping and delivery are the matters of a really high importance – and sometimes, of a deep concern. Both the newcomers and the established store owners are on the lookout for the easiest and cheapest ways to ship internationally, which is why they carefully research and evaluate the available options. Of course, the cost of the delivery is not the only aspect that matters: the entrepreneurs also care about the shipping time, the reliability of the shipping service, and some other details. Let’s talk about them today! How to find the cheapest international shipping options on AliExpress? To begin with, all the AliExpress suppliers offer a different range of the available shipping methods. 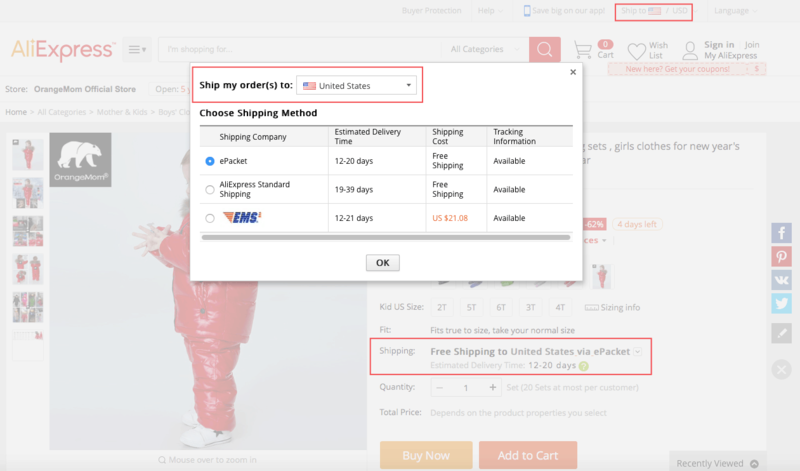 Or, go to any product page within this seller’s store, and check the alternative shipping methods shown in the dropdown menu in the ‘Shipping’ section – look at the screenshot below. I would like to draw your attention to some of the elements of this picture. In the top right corner of the screenshot, you can see the settings for the shipping destination and the national currency (in this case, it is the US and the US dollar.) It is really important to choose the necessary country of delivery and its currency before you start your research: every shipping service has varying fees that depend on the region of delivery. Plus, not every courier can arrange a shipping to any of the 195 countries on the globe! In the lower part of the picture, you can see the name, the price, and the estimated delivery time for the default shipping method offered by this specific seller for this exact product (in this case, it is ePacket, free of charge, 12-20 days delivery). But, normally, AliExpress sellers work with more than one courier, so, if you don’t like the default shipping method, you can check out the alternatives. Next to this Shipping line, there is a small arrow – click on it to view the list of the alternative shipping services available. In the central part of the screenshot, you can see the list of the additional shipping services – this pop-up window appears when you click the tiny arrow. In this list, you can specify the necessary destination again: it’s really convenient if your target audience members live across several countries on the globe, and you want to check whether all these countries can be reached by a particular shipping company. So, in this list of the shipping methods available, you can see the couriers working with the seller, the estimated delivery time and the cost of delivery for the specified destination, and the availability of the tracking information. That’s more than enough data for your research, right? So, what are the priciest and the cheapest ways to ship a package internationally from AliExpress? Costly services of well-reputed international couriers that deliver the packages in a shorter period of time. Here, we talk about such renowned companies as DHL, UPS, EMS, FedEx, etc. They are able to arrange a relatively prompt delivery (the exact time depends on the country of destination), but their shipping costs are really high – sometimes, the delivery fee is several times higher than the price of the product itself. 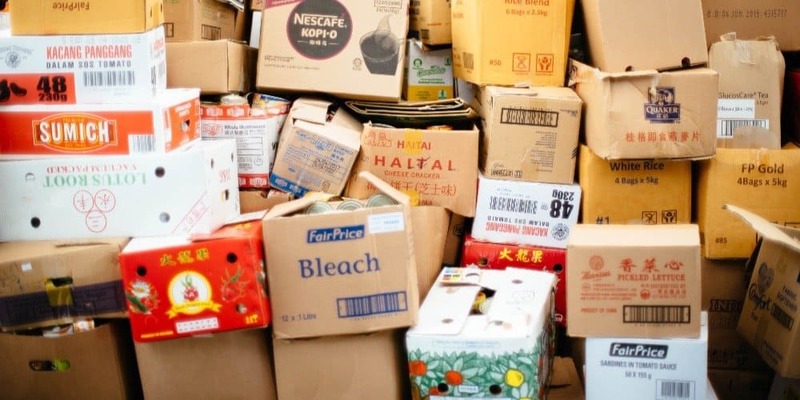 Obviously, it makes them unsuitable for the drop shipping stores selling regular low-cost consumer goods – it’s more reasonable to use them if you’re selling complex tech equipment, electronics, premium clothing and other types of more or less expensive items. Services of local shipping companies that are provided for a low cost or even free of charge, but may require up to 1 month to deliver. 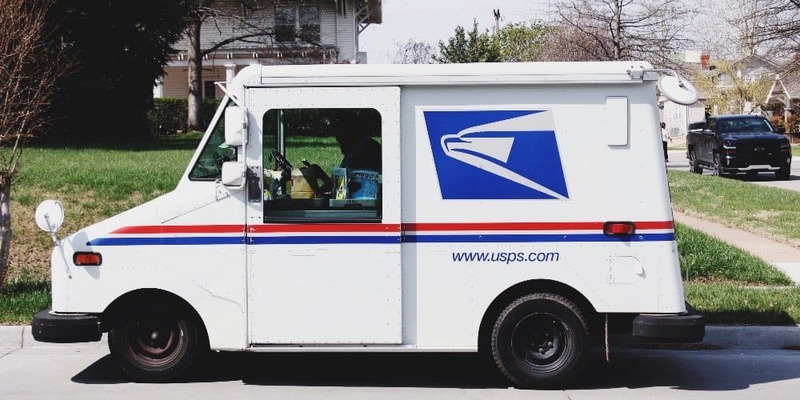 Here, we talk about the usual national postal services and the local companies working as middlemen between the senders and the postal agencies. China Post Air Mail, China Post Small Packet Plus, Yanwen Economic Air Mail, SunYou Economic Air Mail, Hong Kong Post – this is an incomplete list of all the shipping options offered in this category. You can even come across some ‘exotic’ options like Posti Finland (the main Finnish postal service) – quite interestingly, it is widely believed to arrange an even more prompt delivery than China-based services to some specific territories (such as northwestern regions of Russia, for example). Delivery arranged by AliExpress itself through its own logistical partners. There are 2 types of this delivery: AliExpress Standard Shipping and AliExpress Premium Shipping. Both of them mean that the original supplier has handed the products over to AliExpress Shipping Center, and delegated the shipping responsibilities to AliExpress itself. So, in a way, it is a more reliable shipping method than the service of local postal offices. Normally, AliExpress Standard Shipping is one of the cheapest options available on the platform, but again, it depends on the country of destination. AliExpress Premium Shipping is a more expensive alternative, but its average delivery time is relatively low: it is comparable to DHL and FedEx shipping time. What makes ePacket the best type of all the cheapest ways to ship overseas supported by AliExpress? 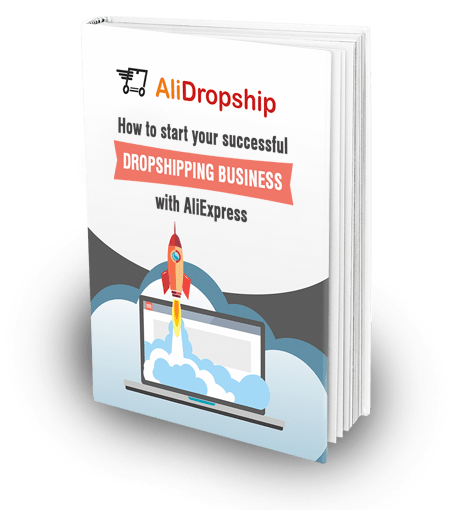 Obviously, drop shipping store owners want to focus on the AliExpress products with the free shipping option – or, at least, with a very low delivery cost. Still, most of these shipping options have one significant disadvantage. By the disadvantage, I don’t mean a long shipping time (it’s not a problem at all, remember?) – here, I mean the impossibility to track the package. As a rule, the tracking codes provided by all these low-cost local shipping services become unresponsive as soon as the package arrives to the country of destination. In other words, you will be able to track the package’s route while it’s being dispatched and transferred abroad, but as soon as the order crosses the border and comes to your country, you won’t find out where it is, exactly. The local country postal service will assign its own tracking to this package, and you won’t know anything about its whereabouts and the expected delivery time until you suddenly find the usual local post notification in your mailbox. Surely, it is hugely inconvenient for an end user; but imagine how bad it is for a drop shipping store owner who can’t provide a high quality customer service to the buyers! We, as the managers of our self-owned drop shipping stores, know about this issue – and we have a solution. So, basically, ePacket is a specific shipping method designed to facilitate eCommerce – it can only be applied to particular types of packages (maximum 60 cm x 90 cm in size and 2 kg in weight), which makes it the perfect solution to ship regular customer goods. With ePacket, the sellers in China and Hong Kong can ship their products to the residents of 38 countries across the globe (see the full list here). On the average, it takes the package from 7 to 15 days to arrive (the shipping period is slightly longer for Brazil and Mexico). It doesn’t cost much, and, what’s the most important, it goes with a proper tracking! At any moment of the package’s journey, you can use the provided tracking code to learn more about your order’s fate. Understanding that ePacket is so convenient for drop shipping store owners, we have designed our own solutions in the way that helps you benefit from this service. 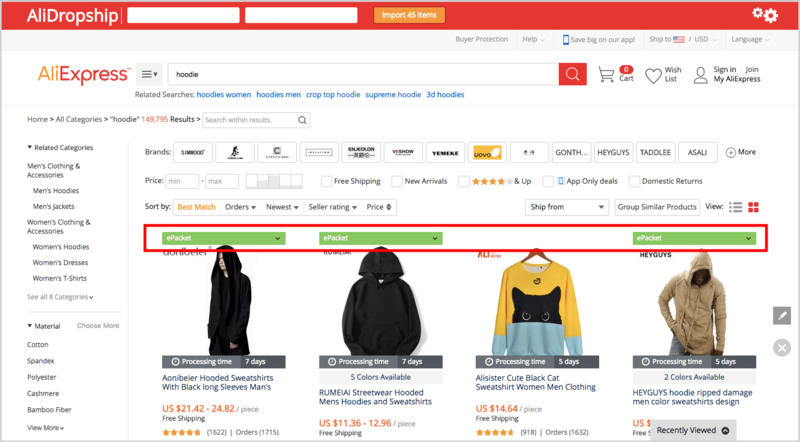 So, if your drop shipping store works on our AliDropship plugin, you can use our Google Chrome extension to instantly check which of the AliExpress products have the ePacket shipping option available. And, our orders tracking system supports ePacket, too! It means that in a couple of clicks, you can retrieve the correct tracking ID from your AliExpress supplier, and email it to the relevant customer. It’s simple. It’s affordable. And it’s super convenient. 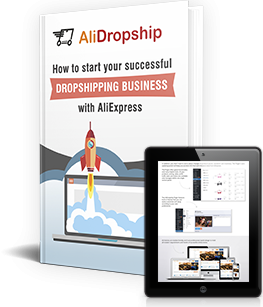 Now, you know much more about the cheapest ways to ship internationally, and you understand how to pick the best ones for your drop shipping store. Use the knowledge for the benefit of your business, and enjoy your entrepreneurial journey! Thanks, I didn’t know about tracking codes going away when it lands. I will start to be more careful about non e-packet prods from now on! Excellent, appreciated ,please bring more of these enlightening features.